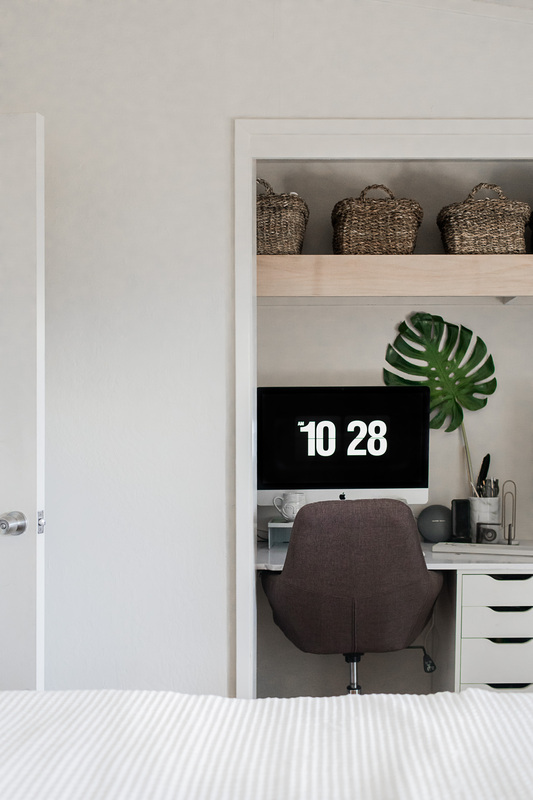 Tips for a Small Space Office - Hej Doll | Simple modern living by Jessica Doll. Working from home has it’s perks, but it also has it’s downsides. We run two businesses from our home and ever since we gave the boys their own rooms, one of my pain-points in our house has been our office space. Since I work from home, I need a dedicated space to keep myself focused and organized, and giving up my office was a hard thing to do. I finally feel like I have a handle on the space, and today I’ve partnered with World Market to share my best tips for a small office space. Since our office is so small and part of our bedroom, I wanted it to really feel like an extension of the room. I kept the inside of our closet light and built a desk using a drawer unit, plywood, and some marble contact paper. The shelf above our desk is simply the basic closet shelf with a wood extension and front piece to make it look a little more decorative and built in. If you don’t have as small of a space as I do, World Market has a huge feature right now on small spaces with tons of perfect furniture for smaller scale spaces. The closet doesn’t get much natural light unless our bedroom curtains are wide open, so I opted for some faux plant-life for this area. The monstera leaf stem and air plant (The lighter color looks most real.) are perfect since they are good quality and easy to clean. My husband added some daylight-balanced plug-in LED light strips around the opening to help give us some more light for work. Be sure the space you are going to work in or around is proportionately filled. Obviously since we’re in a closet I can’t fill it with a huge desk. Originally we had installed a second shelf below the top one. After some time I ended up removing it because I felt like I was constantly working in a cave. It didn’t let light in or air circulate so once it was removed I felt a lot better. Storage has been a huge issue for us, but I used a drawer unit below, wall files inside the closet, and baskets above to give us some added space to store equipment and supplies. Consider also storing items you don’t use for everyday work in another place. A lot of my photography equipment is in our studio area instead of in the workspace. There are no power outlets in our closet. It’s not ideal, but we had to run cables from an outlet in another part of our room. We secured them to the wall using clips to help hide the wire mess and keep the room more clean looking. It also helps to get them out of the way so they aren’t a tripping hazard. The color of the walls should be light and able to reflect light. I originally had a plain waxed plywood desktop, but it still made the space feel dark. After wrapping it in a white marble contact paper the light now reaches all areas of the workspace better. We also ran daylight led lighting strip all the way around to help illuminate the space. Since our office space is so small, my desk has a tendency to pile up with stuff. It’s much less stressful to keep the area clean and only have items I use on a regular basis in the area. Small spaces should be kept clear and uncluttered so that they feel bigger and less claustrophobic while you’re working in them. Do you work in a small space? Any other tips you’d like to share? Wow, that is a really small space. Luckily I have been able to share a small room with my husband who also works at home from time to time, but it is still small and we use the room for some baby stuff as well. I love your tips and I’m going to try to utilize some of your advice. I wish that I had any sort of office space. Working from home has its own sets of challenges, and a lack of office space for me is one of those. I like your space and the use of the baskets. I’ll be moving into a new apartment in a few weeks and was looking for some cute ideas for little spaces. I want to have a similar set up like the one you’ve shared, so i can have an area for my school work and internship. This is so creative and I’ll definitely be jotting down some of these ideas. Thank you! Where didn’t you find the clock screen saver? I used to have that in my mac but for some reason it quick working and I’d like to find a replacement. I totally hear you when it comes to having a small office space. From the pictures you have shown, it really seems like you’ve utilized your space well. Everything looks so neat and well-organized! I love how you were able to pull off a functional office space in a small area. That looks pretty cool. The choice of color was also great. White always makes a space look bigger and cleaner. The overhead shelves with baskets are a unique storage space. I may have to copy that idea. Great job in keeping your work space clutter free! Thanks! I may or may not have Marie Kondo’d the heck out of it last week but I’m much more happy with it now. This is so timely for me! We’re renovating a Victorian apartment in Aarhus, Denmark and at around 1200 square feet, we have one of the largest apartments in the city, believe it or not! I work from home and need a dedicated office space, which is challenging in an apartment of this size. A wall was removed in the kitchen at some point to make it an eat-in kitchen, but we’re putting the wall back up and that teeny tiny maid’s room will become my home office. I’ve been struggling with how to make the most of such a small space andI’m pinning these tips… thank you! I love this! We have a really small house so small space tips are fantastic. Consolidating and putting things in different places that are used too much is definitely what I do. Lighting makes a huge difference too! OMG! I love how everything looks! Working at home does have a lot of benefits but it’s never easy when you don’t have your own space even if it’s small. I love what you’ve done with your office space! Thanks for the tips too! I love that you were able to turn a small space into a productive space. I think I would struggle to keep it clean. I like the basket and shelf idea. Oh wow! What a clever way to utilize a closet! I love everything about this small office space. So neat and uncluttered too! I never thought of putting an office space in a closet- such a great idea! We’re still figuring out the home office piece. We lost our larger home office when we turned it into a bedroom for my son (when our daughter was born.) I love your space! Sounds like our story! Right now the closet is the best option for us since we don’t have a huge shared living space, but I’d love to have it somewhere in the living room area in the future so we gain back a little space in our bedroom. I love how even though it’s small you make it look so classy and neat! Loving the color scheme!